It's January 1. New Year's Day. And I have a confession to make--I didn't watch football. Nor did I watch a parade. Now, I do love a parade but somewhere during this past year I decided that it was okay that I didn't really like football. That's a mouthful for a girl who grew up in a big Ohio State Football supporter family. But there you have it. I really don't care to waste my time watching football. Instead, I choose to spend my time in other endeavors, like... oh, writing. Thinking about writing. Promoting my writing. Pondering my writing. Criticizing my writing. Plotting my writing. You get the picture. My brain just seems to be spinning and sparking the ideas these days. Fiction. Non-fiction. Short. Long. Spicy. Sweet. Let's just hope not dull and boring. My brain is uncluttered. That's right. I've been off work for several days the past couple of weeks. I've gotten enough sleep. I've not been time-zone hopping. I've finished the current wip. Because I'm rested and the chatter is dying down in my head, ideas are springing forth and there are so many, it's difficult to capture them. And not only ideas, but tasks that need to be done and projects I want to finish. So, the name of the game the past few days has been this: focus. Because of all the spinning and sparking, I've forced myself to focus on one thing at a time. So far this week I've stuck with the current novella until I finished it. (yay!) I've revamped the blog. And now I'm reorganizing my office. I won't start the next task until that one is finished. Perhaps, on this January 1--the first day of the new year--that should be my buzzword. Focus. Then perhaps, I can see many of these ideas come to fruition this year. Maddie, this is just weird. Not your blog. Your blog was good! your whole revamped blog page looks great. What's weird is that today I was wandering around doing and thinking about too many things at a time, and the word FOCUS popped into my head. Sometimes you and I hit the same wavelength at the same time, and I always think it's cool. Yes, that's a better description. Not weird. Good luck with your focus. I hope to get latched onto mine, too. Well, you know Magdalena, we are sorta twins, almost, well...our birthdays ARE just one day apart, except for, hm, that I'm many years OLDER than you. Well, then, it's the Libra thing. Yes, that's it. I'm not sure I even completed a sentence there, did I? Anyway, I agree, we often have the same theme weaving through our brains. Actually, when you were wandering around and thinking about too many things, I beamed the word FOCUS over there to you. Yes, really. 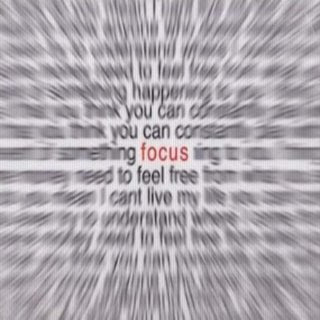 I think it's quite appropriate to be thinking about "focus" on the first day of the new year! And I know just what you mean about being off work for a few days and being rested. I've been off work/school for Christmas vacation for the past week and a half, and it seems that with rest and relaxation comes creativity. I feel like I can stay up past my normal "bedtime" and write once the kids are all sleeping! Thanks for the blog today... I'm going to keep it in mind... maybe even put the word "Focus" on my computer desktop! Hi Any. Isn't it sad that things like work make us so tired we can't think straight or be creative? I guess that is just life, huh? I love your new blog, by the way. It's addicting, isn't it? I think Focus is a good word. Let's keep reminding ourselves of that!